My only complaint is that I didn’t order this sooner. We have 2 large St. Bernard’s that she’d like crazy. This device has literally made our lives so much less stressful as it has eliminated so much of the dog hair and day to day sweeping and vacuuming. Best purchase I’ve ever made, we love it so much!!!! Focus Camera is a photographic specialty retail store in Brooklyn, NY in business for 51 years. For customer service inquiries or to initiate a return, please contact Focus Camera at csfocusov@focuscamera.com or 1-800-221-0828 ext 8202. You can initiate a return for new and unopened items within 30 days of delivery for a refund. To qualify for a refund, items must be in new and unused condition with all original materials and/or accessories. If a return is not received at our processing facility within 30 days, it may be subject to a partial refund. You will be responsible for return shipping costs. However, if the return is a result of a fulfillment error, product defect, or damage incurred during shipping, we will refund the full cost of the merchandise. We will provide a pre-paid return shipping label for Non-Buyer's Remorse returns. All returns are subject to inspection, and if found not to be an error on our part, the return shipping costs will be withheld from your refund. SPECIAL RETURNS INSTRUCTIONS: The Seller cannot accept returns for used items. The Seller charges a restocking fee of 15% that will be withheld from the refund. Connect to clean from anywhere with the Roomba 690 Wi-Fi Connected Vacuuming Robot. The revolutionary, patented, 3-stage cleaning system with edge-sweeping brush is specially engineered to loosen, lift, and suction dirt and debris from all floor types. Dirt Detect technology uses acoustic sensors to alert the Roomba vacuuming robot to clean more thoroughly on concentrated areas of dirt. You can pre-set the Roomba 690 vacuuming robot to clean every day, at times that work best for your schedule and the iRobot HOME App lets you clean and schedule conveniently; now compatible on devices with Amazon Alexa and the Google Assistant. 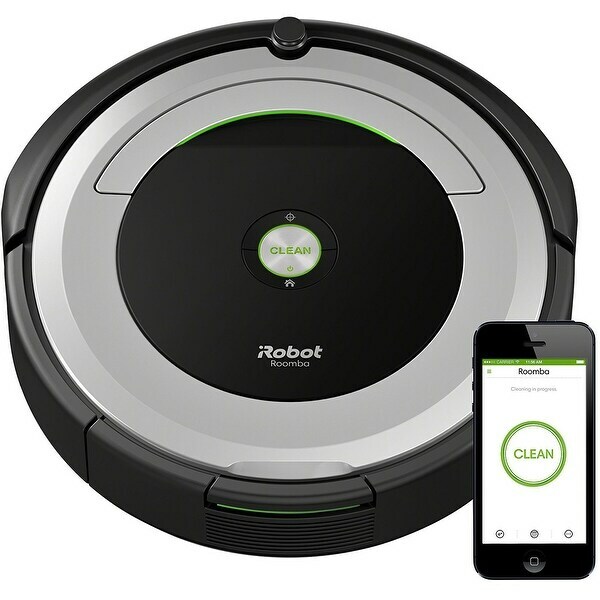 The iRobot Roomba 690 Wi-Fi Connected Vacuuming Robot is built on the proven Roomba 650 robot platform; now with iRobot HOME App compatibility and a sleek new design. iAdapt Navigation uses a full suite of sensors that enable your robot to work its way in and around the nooks and crannies of your home. Uses acoustic sensors to detect high concentrations of dirt and then performs focused cleaning where it's needed most. Low-profile design allows the Roomba vacuuming robot to clean under most furniture and kickboards, so dirt has no place to hide. Cliff-detect sensors allow the Roomba vacuuming robot to avoid stairs and other drop offs. The iRobot HOME App lets you clean and schedule conveniently – anytime, anywhere. Now compatible on devices with Amazon Alexa and the Google Assistant. Your robot can be preset to vacuum up to seven times per week, meaning your home can stay clean every day. Your Roomba robot automatically adjusts to clean carpets, tile, hardwood, and laminate floors as it moves through your home. Your Roomba vacuuming robot is always ready to clean because it automatically returns to its Home Base charging station between cleaning to recharge. Patented 3-Stage Cleaning System with Spinning Side Brush is specially engineered to loosen, lift, and suction dirt and debris from carpets, rugs, and hard floors. The Spinning Side Brush pushes debris into the path of the 3-Stage Cleaning system. This Roomba came so quickly and was packaged well! We recently got new tile flooring and can see everything on the tile. We are vacuuming so much that we decided it was time to let the robot do it! Cannot wait to get this set up and doing the work for us! Awesome product!! Get home and my house is spotless and Roomba is back in his charging pad. We love our roomba it has saved me so much time in sweeping my house. Gave as a wedding gift to a good friend, they absolutely love it. Picks up dirt well and gets around furniture. Best thing I ever purchased! The item was priced very reasonable, and the shipping was very prompt. The app that goes with this product makes everything easier! Love my Roomna best vacuum ever. This is a fun vacuum cleaner and the price was competitive. I’m so glad I bought this. Our dog sheds so much this has helped me out on sweeping so much. I would give it 5 if it would go onto area rugs. "Are the brushes soft? I am concerned about scratching my hardwood floors..."